Blockbuster Video wants you to subscribe to its mail rental service, and it's adding videogames to its catalog in order to do so. Undaunted by its failure to recapture the market it lost to Netflix, Blockbuster Video is now trying to sweeten its By Mail service by adding videogames to the package. As a result, subscribers to the service can now select from over 3,000 titles for the Xbox 360, PlayStation 3, Wii, as well as the original Xbox and PS2. Not only that, but the inclusion of videogames won't cause an increase in subscription fees. The addition of games to Blockbuster By Mail is the result of a test program that ran earlier this year to see if videogame rentals would be viable. Blockbuster obviously feels that the test was a success, and it's clearly trying horn in on GameFly's customer base. 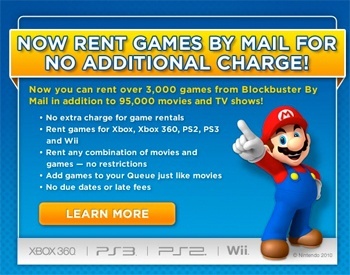 By keeping prices low (By Mail subscriptions start at $8.99, compared to $15.95 with GameFly) and providing customers with a wide selection of movies, TV shows, and games, Blockbuster might be able to attract some new customers who don't want to pay for two rental services. That said, having an inexpensive all-in-one rental service might not be enough to ensure its survival. Blockbuster Inc. (Blockbuster Video's parent company) has struggled to make money for quite some time, but 2010 has been particularly ugly for the company. With nearly $1 billion of debt, getting de-listed from the New York Stock Exchange, and continuing to operate stores that are generally unprofitable, doubts about the company's future seem like pretty solid fiscal forecasting.